○ And, you can even go straight to a title or artist just by saying the name! 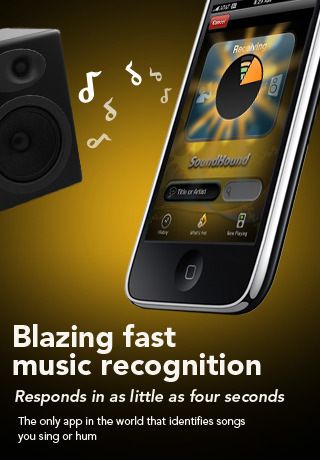 ♪ Blazing fast music recognition: SoundHound can name a song playing from a speaker in just four seconds! ♪ You can sing or hum a tune and SoundHound can guess what it is – tunes stuck in your head might be found! ♪ Now, have you ever searched artists or song titles using your voice? Try voice-activated search and witness the future of how you will interact with your mobile devices– speaking to them! Use SoundHound every day for voice and text searches and iPod integration that brings your songs to life with lyrics, videos, song previews, album information and more immersive features.